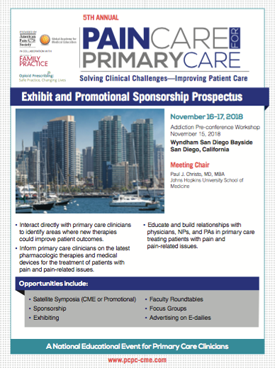 Why Support the Pain Care for Primary Care Meeting? Face-to-face contact with more than 400 physicians and advanced practice clinicians practicing on the frontlines of primary care, treating patients with pain and pain-related issues. Conference schedule and layout configured to maximize one-on-one contact between attendees and exhibitors.